Ray Guy in his hey day with the Raiders. There are jobs in life that go unnoticed until something goes wrong. You can go years without incident, but the minute something bad happens all eyes are on you. Such is the life of a punter. He can go years without getting a punt blocked, or bobbling a snap, or shanking a kick, but the first time he does, everyone notices. For a long time punting was almost an after-thought in the NFL. Players in other positions such as quarterback, runningback, and linebacker also punted. Eventually, punting became a specialty. It took the Oakland Raiders, innovators in so many good – and bad – ways, to select a punter in the first round of the NFL draft. For their faith, they were rewarded with the greatest punter in league history. 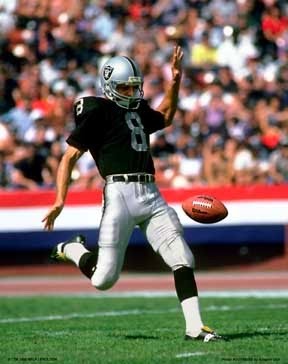 For his efforts, and for revolutionizing the game, Ray Guy was recently elected to the pro football hall of fame – the first ever dedicated, or pure, punter to do so. Ray Guy attended the University of Southern Mississippi where he was an All-American safety in 1972, his senior year. He was also the placekicker and punter, illustrating it was still an era where there were few dedicated punters. The Raiders took him in the first round of the 1973 NFL draft, 23rd overall. Even with the Raiders he did double duty, acting as Oakland’s emergency quarterback and, early on, performed kick-off duties. He would go on to revolutionize the kicking game. His kicks were high, allowing the coverage team to corral the punt returner often with little or no gain. He pinned opposing teams in their own end and, according to Wikipedia, the statistic for hang time was instituted because of him. Three years into his career, the NFL also started keeping track of punts inside the 20. His career statistics, given all that came before him, are staggering. He was selected to seven AFC Pro Bowl teams, including six in a row, and elected an NFL All-Pro six straight years, and apparently he never had a kick returned for a touchdown. He was a three-time Super Bowl champion, including the 1984 Super Bowl against the Washington Redskins where he punted seven times for 299 yards and a 42.7-yard average. Perhaps most telling was that, in the 1976 Pro Bowl in New Orleans, he became the first punter in history to hit the Louisiana Superdome video screen. In 2000, the Ray Guy Award was created to recognize the best punter in college football. He was also named to the 1970s All-Decade Team and the NFL 75th Anniversary All-Time Team. Finally, in 2014, after being eligible for exactly 20 years, Ray Guy was inducted into the Pro Football Hall of Fame. For years, he had been considered one of the best players not in the hall of fame. Ray Guy’s election to the hall of fame was long overdue, and proves again how inaccurate the hall of fame selection process is. Special teams has become such an integral part of the game, it seems obvious punters and kickers should hold their place in the hall. However, the selection of Guy brings the total of kickers into the hall of fame to two. Jan Stenerud, the outstanding plaekicker, is the other. Sports have to honour the pioneers, the athletes who change the game. What we take for granted as common practice now, wasn’t always so. Someone had to think differently, and Ray Guy did just that. It took 20 years to honour Ray Guy. Anyone else ahead of him would have been a travesty. Worse yet, if it hadn’t been him, there would be no one – and that’s an even bigger travesty. Perhaps the most important point Kluwe makes is that Guy sacrificed his own stats, namely punting yardage, for hang time, because it helped the team. That alone makes him hall of fame in my book.